Tall Mom on the RUN: Running on the Road..
Run in Vancouver along the Seawall, cool morning, surrounded by several runners. Although I am LOVING Vancouver, I am a bit homesick already. Missing muscle man and the blue-eyed babies pretty badly...which would explain why I am blogging at 11Pm when I should be sleeping to be ready for tomorrow.. My cutie-pie kiddos they will narrate the first portion of my run report. When I set out at 6:07AM, I was energized and so excited to test my running legs on the Seawall path... Jovial and PUMPED, my mood can be best shown by Easton (17 months). As I set off down the way, past the convention center and toward the stairs to the Seawall, I quickly realized that my mind and heart were overjoyed, but my body did not agree, the feeling portrayed by Blaine ( age 3 1/2). I earned a blister on my right foot from my LONG run on Saturday and I was not able to take care of it since I am on the Road travelling for work...OUCH.. Then to start off the run there were STAIRS....hmmmmm.. I am smart enough to know that if you start with stairs on an out and back, you will end with stairs. -The Seawall is separated into 2 paths, one for bikers and once for run/walkers. Whoever thought of this is AMAZING!! For once I did not have to worry about getting run over. -There was a lanky Asian woman wearing bright Orange capri spandex walking. Instead of walking on one side or the other she swerved, back and forth, right to left, taking up the entire walk way. I tried to avoid her, like I would a sprinkler on the side walk, but her purple shirt was unpredictable. I nearly took her out as I passed. -Along the way I saw Totem Poles, statues, and amazing bridges. -There was a small group of people huffing and puffing together, except for the leader who wore a "Westin Get Fit" shirt. Good for them to be out there. -I passed a restaurant called Crime Lab (would never eat there, WEIRD) and a boat named Lucky Charm, wonder what I would name a boat if I had one? -There were a few Canadian Geese playing king of the hill, the head Goose was intense. -An Otter was swimming near a Marina boat launch, that I probably won't see again on my runs, very cool. -When I got around the bend I could see my hotel across the water....it really hit home that 5 miles is a LONG WAY.... And 26.2 is a REALLY LONG WAY. That is all I have to say "Abowt" that.. LOL...geeez I need to go to bed. Sounds like you had a lovely run, sorry to hear your body was being a pain! LOVED the pics. Well done for getting out there when you're away. 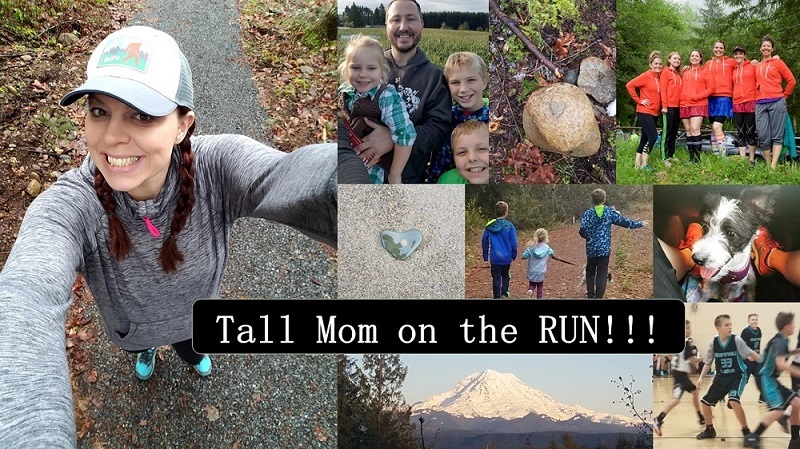 Love the running tales of Tall Mom on the Run! Easton has the sweetest eyes! And it is normal to feel the way you do when you just ran 22 miles and your taper begins, which is what I am assuming as you are 3 weeks out. Taper time messes with your head. Great job hanging in there on a tough run...hope you are having fun, knees are feeling good, and you're not missing the cuties and muscle man too much! i love running in new places, it helps you to get through even tough runs! Even when it's a crappy run, you really can't beat running along the sea, right? I'm so jealous. I ran a couple of days in New Orleans through the french quarter, which was okay but not nearly as cool as your run sounds! Those boys are so cute!